You may need to move a couple of Azure Virtual Machines from on-premises to your Azure subscription. Thanks to Windows PowerShell, uploading a VM to Azure is really easy to do! You must check only one prerequisite before uploading your VM to Azure: you will need to check what type of virtual hard disk is being used by the virtual machine. Hyper-V can use either VHD or VHDX based virtual hard disks. However, only VHD disks can be uploaded to Azure. Azure does not support VHDX disks. Hyper-V VMs on an NFS share on Windows Server 2016 – is that real? A few years ago, we have tried to place a VM on an NFS share. We used Windows Server 2012 because Hyper-V is a native hypervisor from Microsoft. Now we have decided to reproduce the experiment on Windows Server 2016. Just because of boundless curiosity  So, we have 2 nodes: S3n11 serves as NFS Fileserver and S3n12 takes the Hyper-V server role. We will do exactly the same thing as we did before, but this time on Windows Server 2016 on both VMs. Let’s start! VM Fleet is a collection of scripts that enables to deploy virtual machines which perform I/O to stress the underlying storage system. To achieve I/O, the VMs leverages DiskSpd which is a Microsoft tool. When you implement an infrastructure based on Hyper-V, you usually want to get the maximum IOPS and MB/s that your storage can deliver. This tool helps you to get this information by stressing your storage. In this topic, we will see how to deploy a VM Fleet to benchmark the storage system. They avoid the need for agents by making the API’s remotely accessible. It’s all WMI calls directly to Hyper-V. They implemented their own CBT mechanism for Windows Server 2016 Hyper-V to reduce the amount of data that needs to be copied during every backup. This can be leveraged by any backup vendor and takes away the responsibility of creating CBT from the backup vendors. This makes it easier for them to support Hyper-V releases faster. 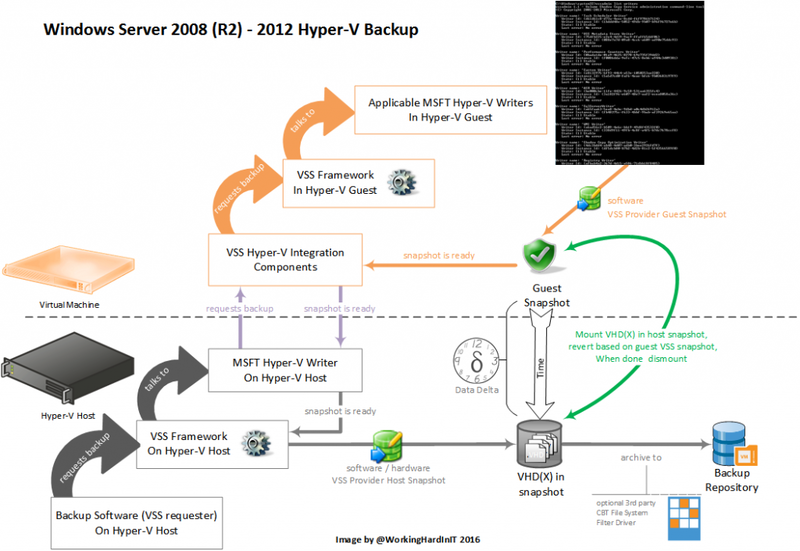 This also avoids the need for inserting drivers into the IO path of the Hyper-V hosts. Sure the testing & certification still has to happen as all vendors now can be impacted by a bug MSFT introduced. They are no longer dependent on the host VSS infrastructure. This eliminates storage overhead as wells as the storage fabric IO overhead associated with performance issues when needing to use host level VSS snapshots on the entire LUN/CSV for even a single VM. This helps avoid the need for hardware VSS providers delivered by storage vendors and delivers better results with storage solution that don’t offer hardware providers. Storage vendors and backup vendors can still integrate this with their snapshots for speedy and easy backup and restores. But as the backup work at the VM level is separated from an (optional) host VSS snapshot the performance hit is less and the total duration significantly reduced. It’s efficient in regard to the number of data that needs to be copied to the backup target and stored there. This reduces capacity needed and for some vendors the almost hard dependency on deduplication to make it even feasible in regards to cost. These capabilities are available to anyone (backup vendors, storage vendors, home grown PowerShell scripts …) who wishes to leverage them and doesn’t prevent them from implementing synthetic full backups, merge backups as they age etc. It’s capable enough to allow great backup solutions to be built on top of it.